Pay applications may be recorded to document the "paying down" of a Project’s contract amount by the owner. 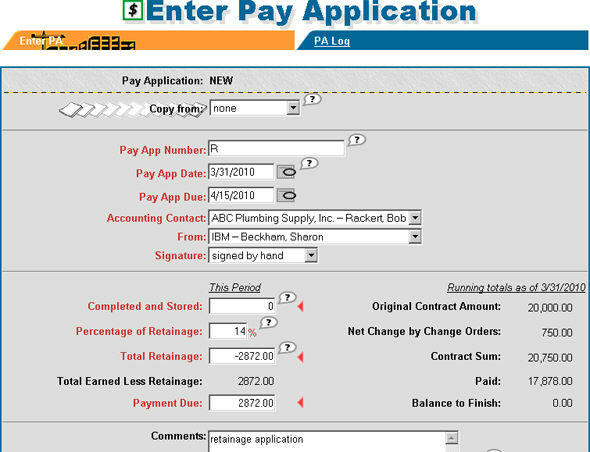 The Pay Application module is composed of four main sections: 1) recording the original amount of the contract for the project, 2) monitoring the status of the contract and pay applications via the Project Summary page, 3) maintaining a spreadsheet of the "Schedule of Values" in which the current values of expended work are tracked and summed, and 4) entering periodic pay applications based upon the current summary values of the "Schedule of Values" until the contract amount is paid off. Enter a value in the "Original Contract Amount" field; this number should not change during the life of the Project. Additions to the contract should be added via approved Change Order Requests. `You can keep up to date on the summary status of your Pay Applications via the Project Summary page. The "Contract" box summarizes the Original Contract Amount and any Approved Change Order Requests to date: this combined amount is displayed as the Revised Amount. 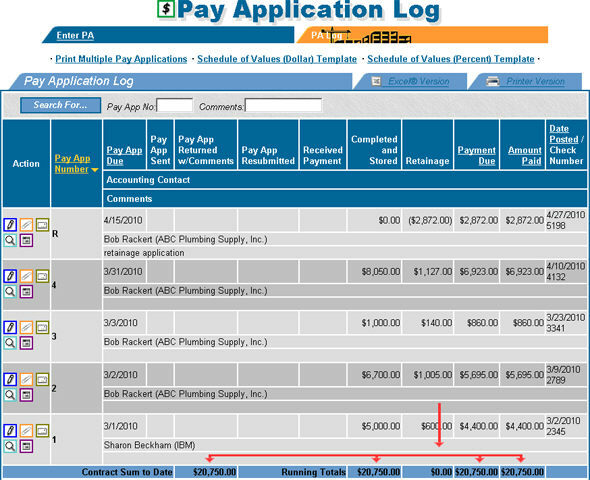 Summary values for pay application "Billed Amount", "Paid Amount", and "Retainage" are displayed, along with the "Last Pay Date". This table allows you see at a glance how much of the Project’s contract has been billed and paid to date. You may access a Schedule of Values Template via the Pay Application Log page (see example of the link below). Two templates are provided: one by dollar amounts and another by percentages. Select the template that matches your business model. Maintain your spreadsheet over the life of your Project. As you apply for payments transfer summary field values from the spreadsheet to the Enter Pay Application form within eSUB (see next section.) You may wish to attach the spreadsheet to the initial pay application of the Project so that it is readily available to the Project. 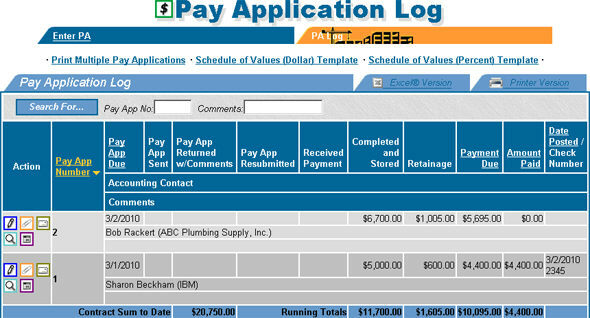 Each time a new pay application is entered it is based upon the running totals accrued from previous payments. These running totals are reflected on the form and transferred by you from the Schedule of Values Spreadsheet. This will result in the proper calculation for "Payment Due". Two columns are presented on the "Enter Pay Application" form: "This Period" (that allows you to enter the current pay application) and "Running totals…' (that displays the running totals and Balance to Finish). Under the "This Period" column enter the dollar amount "Completed and Stored" for the period from your Schedule of Values spreadsheet. The "Percentage of Retainage" will default based upon your settings in Project Preferences, if any, and the "Total Retainage" and "Payment Due" for the period will be automatically calculated. The "Payment Due" is the amount that you are applying for payment. The Pay Application Document reflects the G702. Each pay application will appear on the Log (initially sorted by most recent first). Note that at the bottom of the Log the "Contract Sum to Date" is displayed. On the same line, running totals for various columns are displayed. This allows you to see at a glance how much work you have completed ("Completed and Stored"), how much retainage has been held back ("Retainage"), how much has been billed ("Payment Due"), and finally, how much has been paid ("Amount Paid"). To record your application for retainage, leave the "Completed and Stored" field at zero and enter the negative amount of your accrued retainage amount in the "Total Retainage" field. This will calculate the positive amount for accrued retainage in the "Payment Due" field for you. Note that the totals for "Contract Sum to Date", "Completed and Stored", "Payment Due", and "Amount Paid" are all equivalent ($20,750.00). Also note that the running total for "Retainage" now is zero. Why is my "Net Change by Change Orders" amount on Pay Applications different than the Change Order Log?